You are here: Home > Events > It’s time for the 14th Annual Snowmobile Fun Run! Hosts: Swamp II – Frederic, Mama Leone’s – Gaylord, Porter Haus – Gaylord, The Keg – Waters, and Tinker’s Junction – Grayling. Main Sponsor: Hart Dealerships. Also sponsored by our friends at: Tip’n the Mitten, Grayling Restaurant, Grayling Auto Repair, Midge & Co., and BC Pizza. Route: Leisurely ride begins after lunch and check-in at Swamp II, stopping at each host location, ending with dinner and fun at Tinker’s Junction. If the weather doesn’t cooperate, the ride will take place by personal vehicle. Non-sledders – all ages encouraged to participate by car. JOIN US and support CCUW that supports our strong community. 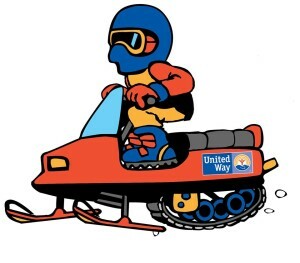 Crawford County United Way is a 501c3 nonprofit organization. All donations are tax deductible and very much appreciated! “Like” Us on Facebook at www.facebook.com/CrawfordUW join the event! Pre-registration is advised & appreciated so meals can be planned. You can also pay your registration fee by clicking on “Give” under our name at the top of the page and clicking our “Donate” button. Please include the number in your party and your phone number.